Christmas Eve, as we were preparing the house for Santa's arrival, Evan let us in on a little secret: "You know something? Santa likes chocolate milk best. We should make his milk chocolatey." It took Evan three hours to open all of his presents. Literally. It took Max minutes to open all of his presents....and then he stood at the pantry signing "Please" for breakfast. When we didn't immediately go over to help him, he took it upon himself to open the pantry, reach up for the Cheerios box, and bring it over to the family room. Mr. Independent. Evan loved his surprises from Santa, but for the first time this year, I saw that Magic Moment: Back in September, we were at Target and Evan saw a tractor trailer truck from the movie Cars. He loved it and said, "I really wish I could have that truck." I told him that he could put it on his Christmas list and maybe Santa would bring it to him. When he opened the present and saw that tractor trailer truck (this was at about hour 2:45 in the 3-hour unwrapping process), his mouth hung open in stunned silence. After a pause he said, "This is JUST what I ALWAYS wanted!" He remembered wanting it, and it hit him that sometimes, wishes do come true. Max has coveted Evan's baby doll for weeks now. Evan only really wants anything to do with the doll when he sees Max heading for it, but once there was even a wrestling match over it (and I had my first glimpses of my boys fighting over a girl--yikes). Naturally, Santa was THRILLED to be able to give Max his very own baby doll for Christmas...you know, since he loves baby dolls so much. Only, Max won't have anything to do with it. In fact, when Max walked into the family room Christmas morning, he saw a brand new Max-sized chair from Santa, and sitting in the chair was the baby doll. Max went right over to that chair, grabbed the baby doll by the arm and flung it across the room. The only time Max expressed any interest in the doll whatsoever, was when Evan was looking at it. Me: You know, you could give each of the guys names. Like....Joe or Thomas. Evan: [thoughtful deliberation] Okay, my guy is Workman and your guy is Mr. Workman. Me: Well....okay, but what about something like Ed or Pedro? Evan: Oh, okay. So this guy is Hand and that guy is also Hand. Me: [OMG, what is WITH this kid?] Why don't you think of DIFFERENT names for each guy? Evan: OH! This guy is JoJo and yours is CoCo. Me:..............Let's just call them all Guy. 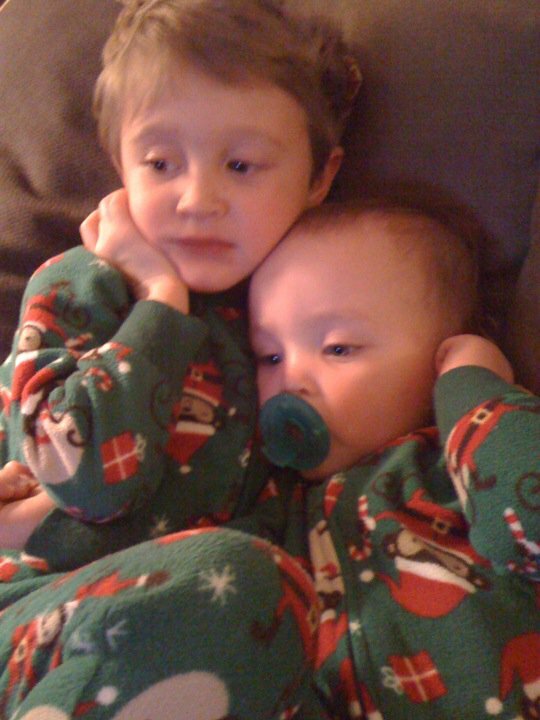 ...two snuggly boys, still in their Santa jammies, watching a pre-bathtime Christmas special together after a long, magical day. Truly, the most wonderful time of the year. Today we made Yogurt Finger Paint! Or....in Evan's case....Yogurt Regular Paint. There is nothing like pregnancy and motherhood to better remind us just how primal we are.....still. Regardless of the evolution of our species that has brought us to where we are--and who we are--today....Regardless of the technology that exists now to make life Easier, Faster, Better....Regardless of how much research has taught us and how much we Know....Regardless of just how Civilized we all are....the raw emotions, the instinctual behaviors, the way the body and the mind and the heart Just Know what to do, all remind us that as much as things change, so much more stays the same. The first time I recognized just how amazing and Bigger Than Me my Pregnant Body was, I was about 24 weeks into my pregnancy with Evan. I wasn't a big meat-eater, but had craved meat--particularly hamburgers....particularly McDonald's hamburgers--my entire pregnancy. Just past the halfway point, however, I Could Not Get Enough red meat. I would stop by Mickey D's on my way home from work and order a hamburger. Then I'd get home and cook spaghetti with meat sauce. It came as little surprise then, when my Obstetrician called to tell me that my bloodwork came back showing that I was anemic. As it turned out, I had been self-medicating. An iron-supplement helped restore my iron levels and my cravings subsided to less-nauseating desires. And then, my baby was born. And I had a job to return to. I had dreaded the thought. In fact, I refused to acknowledge the thought of returning to work. But I had to. We had just bought a big new house--I had to. And then, two weeks before my contract was going to start, I realized that I just couldn't. It was suddenly clear to me that I would, literally, sell the house. Hell, sell a car. I just wouldn't, no....COULDN'T, leave my baby. It wasn't a choice. The Cavewoman in me was baring her teeth and thumping her chest. And when I called Sam at work and told him, he recognized her. He came home from work that day with financial statements, spreadsheets, and the understanding that you don't mess with Mama. We worked it out.....and ended up keeping both the house and the car. .....Months later, Evan had an anaphylactic reaction to trace amounts of milk in the rice cereal I was feeding him. My first thought, once I was assured that he was alright, was: What if this had happened at daycare? What if it wasn't trace amounts of milk that he was exposed to, but an entire bottle of milk-based formula? I literally shudder when I think about it. There have been countless moments of Cavewoman Mama since then....mostly protective instincts, gut-feelings, and the unbelievably amazing way that the body prepares for and behaves during labor and delivery. Last week, I weaned Max after fourteen months of breastfeeding. He had self-weaned within the last few months down to three feedings a day: before nap, before bed, and at 5 am when he woke up too early and came into our bed. A few weeks ago I was able to help him to drop the naptime feeding and he handled it beautifully. I decided to drop the last two feedings at the same time because it didn't make sense for me to feed him at 5 am and not bedtime....and quite frankly, I didn't want to fight with him at 5 am. I wanted to just tell him that we were All Done Nursing. He knows All Done. He signs All Done with great gusto when ready to get out of the high chair. It made sense. He whined a bit, but seemed to understand. He went to bed beautifully and slept well.....and has every night since. He's such a good boy. ...he's just a little more Big Boy now. Sometimes you need to put away the parenting books and resist the urge to Google and just Be a Mother. I have never in my life bought beef that wasn't already ground up. Seriously. I've also never bought any meat still on a bone. I'm not really adventurous when it comes to cooking or eating meat, but this recipe looked really perfect for a snow day. I had to bring a cheat sheet with me to the store to ensure that I got the right kind of meat for this one. I was looking for Beef Chuck Roast. The cuts of meat were packaged to look like really big steaks. It had a sticker on it that said, "meat for marinating." Hopefully that helps any other meat-buying novice out there. Coat crock pot with cooking spray. Put in chunked meat, spaghetti sauce, and water. Cook on low for 7.5 hours. Add uncooked pasta, carrots, green beans, and peas (or whatever other veggies you have on hand) and cook on high for 45 minutes. Throw in a handful of baby spinach leaves for the last 5-10 minutes. I've never eaten or seen "pot roast," so I'm not sure what the traditional consistency is, but this is like a super hearty pasta dish. The meat is fairly shredded by the end and the larger chunks can be cut with a fork. Most of the liquid is absorbed, so it's not soupy at all. A super easy, super delicious meal that your whole family will love. Seriously, even Evan liked this one. Well, minus the noodles and veggies and with all the "sauce" scraped off the meat, which he then dipped in ketchup. But add raw carrots and pear slices and even he ate a balanced meal! I have witnessed tantrums that deserve to be written about on several occasions. I have watched a baby writhe in defiant anger and a preschooler become so unbelievably obstinate that it takes every ounce of control to see the situation through to the end. I have felt my blood pressure rise at the sights and sounds of my children acting in ways that I thought only Other People's Children acted. But none of this could have prepared me for today. Today is a day that will live in infamy. At least in my own memory. Today is a day that, in similar future situations (god help me), I will refer back to in an attempt to deescalate an impending public tantrum. From this point onward, today will be known as The Day I Tried to Get Both Boys Vaccinated at The Same Time All By Myself. Now that I've had time to regain my composure (and pour a healthy-sized glass of wine), let's take a look back, shall we? Before the appointment this morning, I talked to Evan about what was going to happen. Luckily, I had some pretty enticing errands to run today, so I worked in a little bribery: "So, Evan, today we're going to get our Flu Vaccines. I need you to be a Big, Brave, Big Brother because Max might feel a little nervous about it. You don't need to be nervous about it because YOU know that a shot pinches for a minute but doesn't hurt for long." This was met with deliberate avoidance of eye-contact. "And besides, after the super-fast visit to the doctor, we get to do so many fun things! We get to go to the toy store that has the train table that you love to play with so much! We ALSO get to go to the grocery store to buy the ingredients to make cookies this afternoon! Doesn't that sound like fun?!" Evan perked up at this, but still seemed a bit reserved. I dropped it for awhile. Later, during snack, I said, "Okay, let's finish up, it's just about time to go get our vaccinations!" At this, Evan crossed his arms across his chest and put on his best grouchy face, "I am NOT going to go. THAT is my decision." Oooooooookay. So that's how we're going to play. Somehow we got TO the doctor's office without incident. We even got into the room without so much as a whine. I bear-hugged Max and exposed his chubby thigh. Evan dutifully held Max's hand while the baby got poked and said, "It's okay, sweet lovey." And then. Then the nurse looked at Evan. Then he stomped to the door and crossed his arms and said, "I'm just walking out this door." So I said, "Not just yet, hon..." And then It Was On. Full-force, kicking, flailing, screeching, yelling. At one point he was under a row of chairs with a death-grip on the legs on either side of him. He was growling and thrashing. I would not have been surprised if he had started foaming at the mouth. It was animalistic. And Max. My poor, sweet, just-got-a-shot baby. Instead of getting hugs and loves from Mommy, he was standing in the middle of the room, somehow avoiding the fray, just hysterical. Purple-face, breath-holding, screaming sobs to the point of shaking. It was the most upset he has ever been. And yes, I do remember how upset he was, just last week, when I was holding a nebulizer mask over his face. Somehow I was able to get Evan into a bear-hug and said/yelled to the nurse (who was sweating as badly as I was), "JUST DO IT." But it wasn't DONE, because *I* wasn't done. I, who had just gotten a more intense workout than I have since labor....I, who, was so embarrassed by the behavior that my child displayed that I am contemplating switching pediatric practices...I, who, felt so sorry for my younger child, who was exposed to such an ugly outburst....I, who, admittedly, hold grudges....wasn't ready to move on to a Happy Day quite so easily as my 3-year old. The 12-minute drive home was a 12-minute lecture. Which, I know, was about 11.5 minutes longer than my 3-year old was able to pay attention. We got home and it was Time Out for a LONG time. Time Out in our house is really just a cool-down/separation time. It's time alone in his room, but he can do whatever he wants there, as long as he's not throwing a tantrum and stays put until we go in to Talk. I wasn't ready to Talk for close to an hour. Wanna know what he said when I finally went in there? "Wow, Mommy. I just had such a nice time reading my books." This kid knows Exactly how to push my buttons. We somehow got through the afternoon. I was stilling holding on tight to my grudge (I'm working on that, by the way), but I was able to be a present and pleasant Mommy. Sam got home and I headed out for my own Time Out. Time to cool down.....Time by myself. I headed to the grocery store, so I could at least feel like I was checking something off The List. And guess what I'm doing tonight? Mommy's Time Out was just what the doctor ordered. I got home to three happy guys, eating dinner together. Had some snuggle time, reading on the couch with the littles before heading up for baths and bedtime. And again, am reminded to Not Sweat The Small Stuff and be thankful. Oh, and next time, Daddy has Shot Duty. Monday, bronchiolitis. Breathing treatments every four hours. Not sleeping. Not eating. Not his easy-going, happy-go-lucky self. He's been a Hold-Me kid for the past three days. He's been a raspy, rattly, wheezy, pitiful little thing. As it turns out, this is Exactly what a penicillin allergy looks like. Yesterday was Day 10 of Amoxicillin that was prescribed for the ear infection. Most reactions to the drug occur as a pinprick rash on Day 9 and a widespread spotty rash on Day 10. He was right on schedule. So, out with one, in with another, that's how it seems like allergies work around here. But that's okay. When I saw this baby at 4:30 this morning with these red spots all over his poor little wheezy body, I was Worried. Like the kind of worried where you know you don't need to race to the ER, but you're wondering if you will soon. A penicillin allergy is the best news I could have heard at the doctor this morning. Well, that coupled with the clear lungs and "beautiful" ears that the check-up revealed....it was a good appointment. And now my poor little spotty, but not-as-wheezy baby is enjoying his first Good Nap all week, thanks to a healthy dose of Benadryl. As is always true, it's helpful to look at the bright side. Today, I am thankful for a penicillin allergy, and am thinking of Kristin and Isabella. 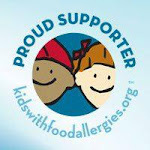 Today, Kristin, a fellow food allergy mama, is sitting at Isabella's bedside. The four-year old has been having seizures caused by meningitis. She is in a drug-induced coma and has sustained an as-yet-undetermined amount of damage to her brain. Her daughter may never be the same once she recovers from this illness, and yet even Kristin is thankful that her daughter, though changed, is still with her.